Pan seared sashimi grade tuna drizzled in a refreshing ginger ponzu sauce and finish off with sesame seeds, this tuna tataki recipe is a delicious treat for seafood lovers. It’s easy to make at home too. Don’t forget to watch the video tutorial for the preparation process! 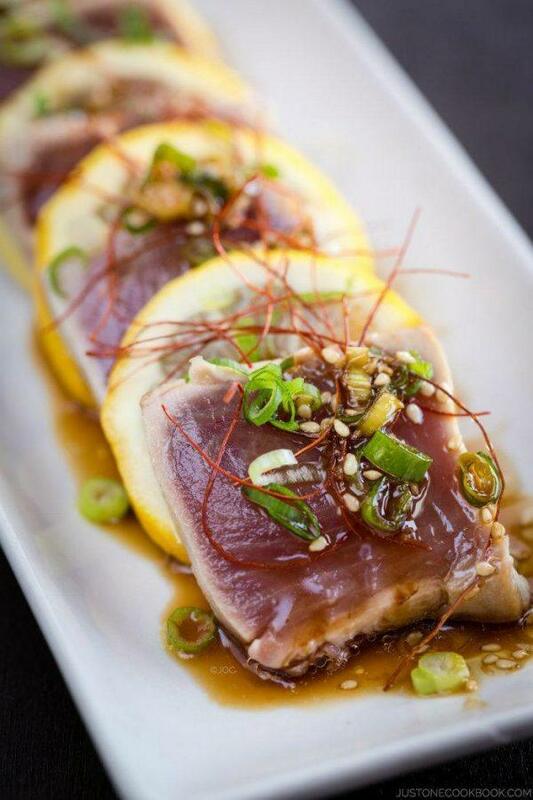 Tuna Tataki (キハダ鮪のたたき) is a yellowfin/ahi tuna lightly seared and served rare with a citrus based soy sauce. 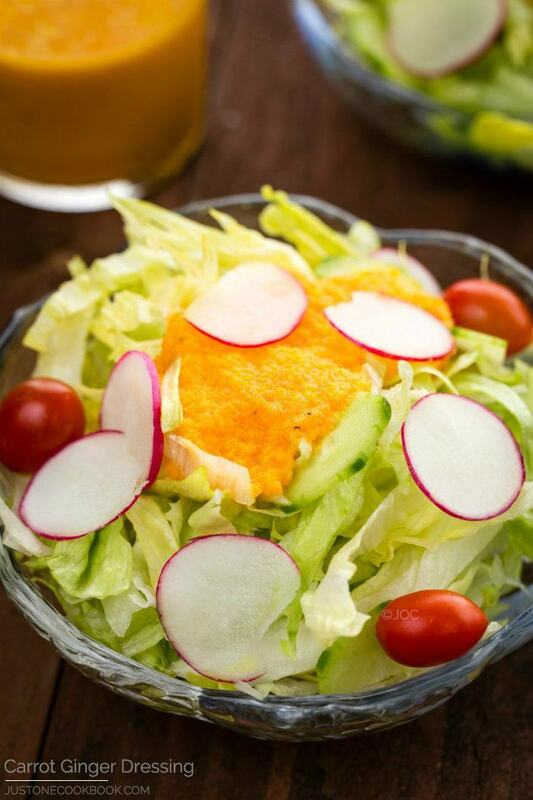 It’s very easy and quick to prepare, and it is a light yet flavorful appetizer to start a meal. 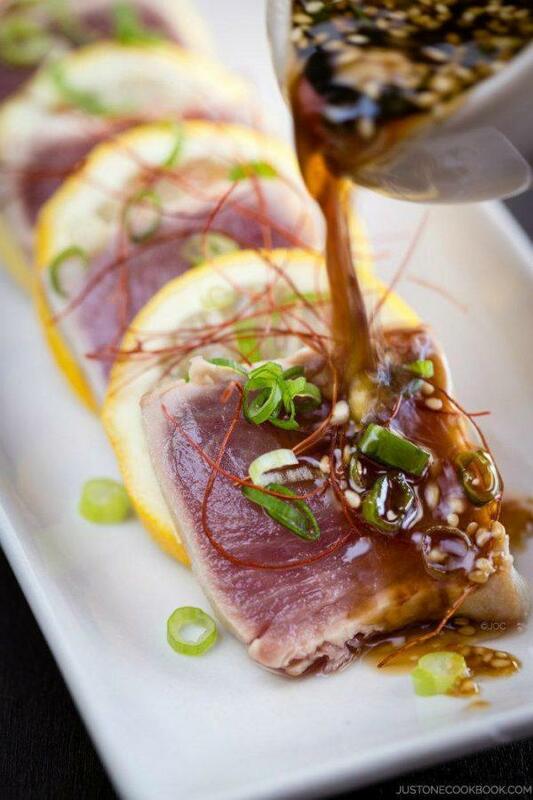 Pan seared sashimi grade tuna drizzled in a refreshing ginger ponzu sauce, sprinkle with white sesame seeds. You may wonder what “tataki (たたき)” means. The literal translation of tataki is “pounded” in Japanese which doesn’t really anything have to do with searing. There are a few theories for the origin of name based on different ways of preparing fish (or meat) in Japanese cuisine. The first one is when you lightly sear the fish over a hot flame or in a pan and briefly marinate in the citrus-based sauce, you would gently “pound” the fish with fingers with marinade. The other theory says the word comes from the pounding of the fish with the knife when you sprinkle salt on the fish prior to cooking or pounding the fish with grated ginger or green onions to enhance the flavor. 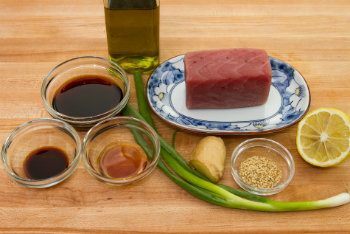 For the sauce, there are several variations for tuna tataki recipe. 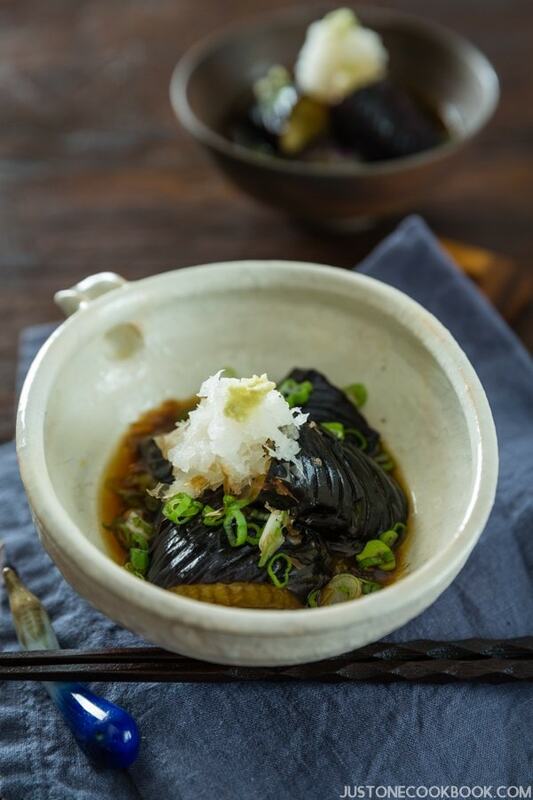 The most common sauce is simple citrus base soy sauce with choices of shiso leaves, green onion, and grated ginger/garlic/daikon. I hope you enjoy making Tuna Tataki! 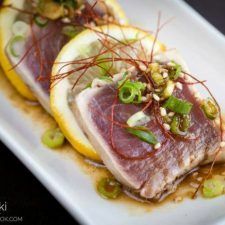 Pan seared sashimi grade tuna drizzled in a refreshing ginger ponzu sauce and finish off with sesame seeds, this tuna tataki recipe is a delicious treat for seafood lovers. It's easy to make at home too. Don't forget to watch the video tutorial for the preparation process! Grate ginger and slice green onion thinly. Combine the Tataki sauce ingredients in a small bowl. Heat the oil in a non-stick frying pan. When the oil is hot, sear the tuna 30 seconds on each side. When all sides are seared, remove from the heat and let it cool. Slice the tuna into 1/4 inch pieces. Pour the sauce and serve. 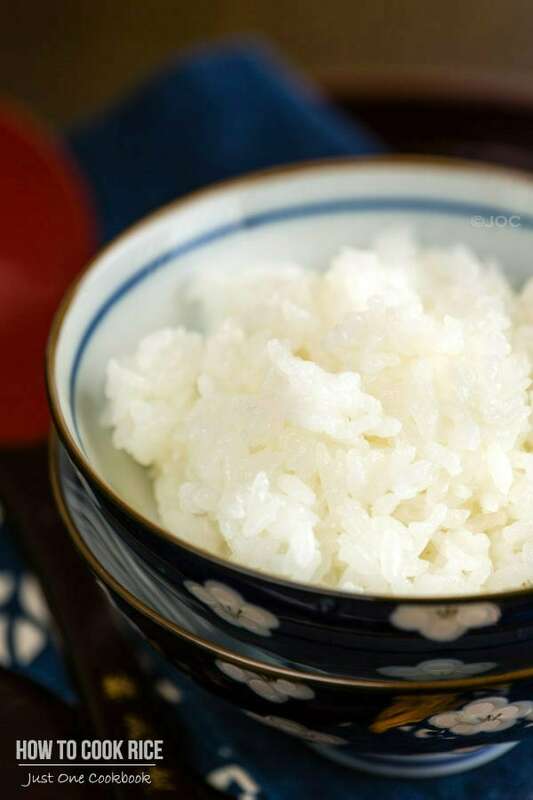 Ponzu: Homemade recipe, click here. You always make Japanese cooking seem so easy. I love this type of tuna when we eat out. But now I can make it at home, thanks to your video and blog post. Thanks for sharing and all the blog-love, Nami! Hope your week is going great. Oh YUM. I’m so happy to have this recipe now. I love ahi tataki. I had it for the first time at Ethel’s Grill, a little hole-in-the-wall local place in Honolulu. 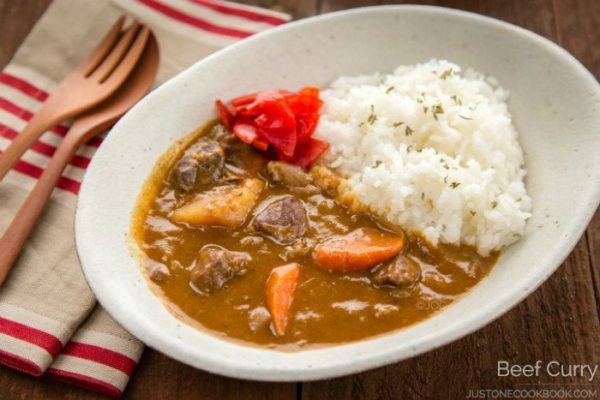 It looks like they make it pretty much like you do, but add daikon sprouts! I’ll definitely be making this for myself. Thanks! Yummy though I’m curious what those very thin red strips are. It is Korean chili threads. 🙂 I use it for garnish, but you can taste a little spiciness too! that piece of tuna looks delicious!! 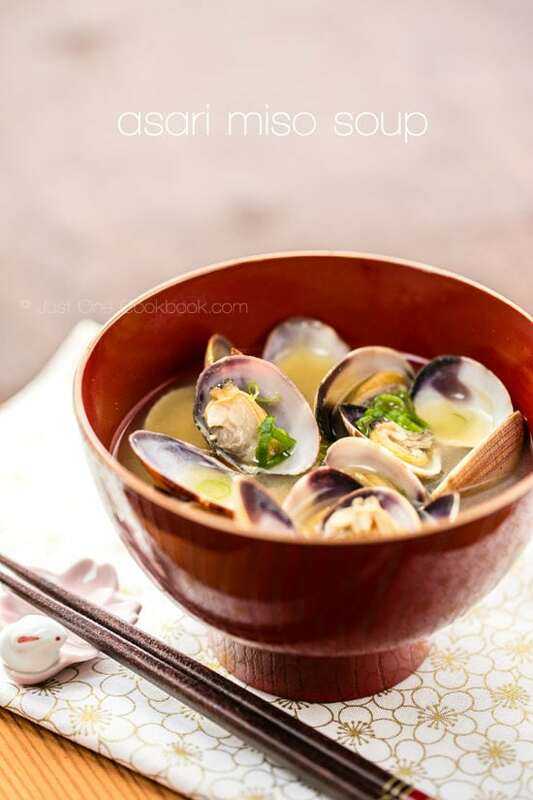 Nami – this is one of my oldest son’s favorites whenever we eat at a Japanese restaurant – can’t wait to try this at home. He’ll be thrilled! Thanks for sharing this recipe and video. I can’t stop going back to look at the photo with you pouring the sauce over the tuna. That’s pure magic. It’s a beautiful dish, Nami. Such great photos! And such a great recipe. You’ve outdone yourself — thanks. How do you make it look so easy? I love your videos. They are one of the most easy videos to follow ever. Such a great dish. Bookmarked. I can only imagine the taste of this tuna.. I love this fish, and I’d definitely love tasting this dish! Seriously the picture can actually makes you drool…. and yes, me too, going back again and again looking at that delicious piece of tuna! It is kind of cruel….can see but cannot eat! I suppose that this sauce would also be good with other fish? Looks beautiful and sounds like really flavorful appetizer! This has to be the easisest recipe for tuna tataki ever! But is one of the most stunning I have seen. I love your videos! It means I cook along with you and make it so much easier for incapable cooks like me. So going to fish market this week to make this! I love recipes like this. Can I have some? This is beautiful, Nami! I love sashimi and tuna definitely is on top of my favorite sashimi list. I love how you presented with searing the outside and with lemon slices. The sauce looks like the prefect match, too. What an elegant dish it is! I’ve always been nervous about serving raw fish even though I eat it all the time when I dine out, but you make this look so easy! This looks incredible and is my all-time favorite seafood dish! It’s hard to beat perfectly seared tuna, and yours looks spectacular! This looks so scrumptious! The sauce looks really tasty too! The fresh tuna must be so flavourful with that sauce! Marvelous! What great flavors. And I love the way the tuna has been seared. 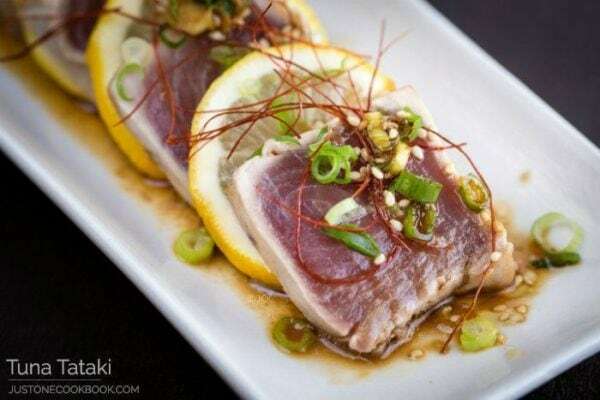 Wow Nami the Tuna Tataki looks mouth watering. I can’t wait to try this and the korean chili threads need to be in my life asap. What a gorgeous way to garnish this! Thx for the recipe. This really seems easy but leave it to me to mess up somehow. I always appreciate you sharing stories behind the recipes. I feel like I could just drink the sauce! I order this dish all the time but I’ve yet to make it. I did a beef tataki one day which was just as good. What side dish would you serve this with? Nami I’ve never seen tuna come in a square. Do they just carve it that way prior to sending? I love this recipe. My husband and I order this almost every time we go out. Great recipe and so simple. Thanks for sharing. I saw on someone’s site through comment Luv that you had DSLR video tips but couldn’t find that link. I’d love to read it since I stink at all that. Can you send me that link, it doesn’t connect through her site? Oh my goodness, I’ve been so dumb… all my life I assumed that the fish was cut FIRST, and then fried on each side and I always figured it must be so annoying, trying to fry the outside of a tiny square of fish. Haha! Ok, doing it this way makes so much more sense! Thanks for sharing it Nami – it looks so good. This looks so classy and effortless, and I imagine it tastes wonderful too. Great use of chilli strips for garnish, as well, I better go hunt some down haha. Do you think this dish would taste okay with salmon as well? I just cannot tell you enough how much I love all your recipes, pictures, and the way you show the steps to make them simple enough. I also like the way you place your food beautifully in the plates! Thanks for posting! This tuna tataki recipe is brilliant, along with so many of your recipes. Your background music for your videos is also great, and I am wondering if you could share the title and artist of the Gypsy Jazz music you used in the tuna tataki video. My son is a Gypsy Jazz guitarist and is really enjoyed the music… and the tataki! Thanks! Hi Pete! 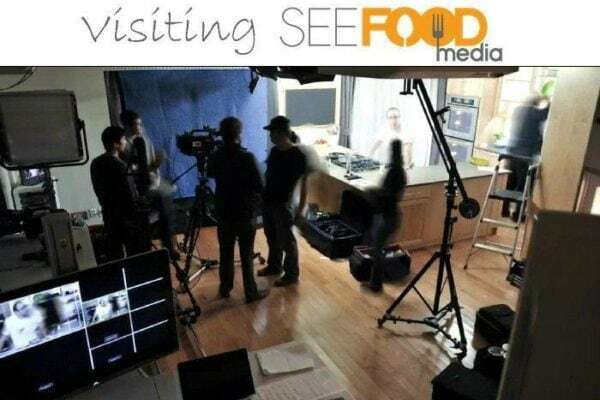 I’m so happy to hear you and your son enjoyed this recipe (and other recipes of mine) and our selection of music for this video! The artist name is Jeremy Sherman (see links below). Thank you so much for your feedback! Hi Nami, first time poster but I’ve been creeping on your website for a couple years already! Made many a recipe! One question; how long do you find seared tuna like this, or your tuna poke will last in the fridge? I know it’s always best to eat fresh, but I have a hunk of frozen ahi that is really too big for just one meal. Thanks in advance! Nami. It is pretty hard to find recipes that come out as one desires. Your Tuna Tataki’s recipe is just outstanding. Although I may figure it out how one could make it on the grill. I would rather ask to you guide to accomplish so. i made this recipe yesterday for new year’s and it was AMAZING everyone loved it! Hi Fa! I’m so happy to hear that everyone enjoyed this recipe! Thank you for your kind feedback! Is this ok to eat for a diabetic? Since it appears fishforsushi.com is no longer in business do you have a new “go to” for purchasing the fish?